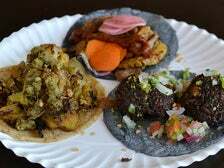 Whether you’re a starving student or have some more resources to spare on your meals, the South L.A. neighborhoods surrounding the University of Southern California (USC), Los Angeles Memorial Coliseum and Banc of California Stadium offer some interesting dining options. Learn about some of our favorite area restaurants, most of which are within walking distance of the USC campus and Exposition Park. 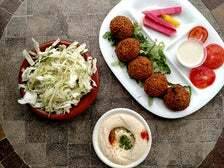 Falafel, a fritter crafted from garbanzo beans, fava beans or a combination of both beans, has historical ties to Egypt, but can now be found across the Mediterranean and Middle East. Regional nuances are evident in versions from countries like Armenia, Israel, Lebanon and Syria. Color, spicing and shape are key differentiators. Regardless of how they’re made, falafel is having a moment in Los Angeles, with modern interpretations joining classics. Learn about 10 of the best falafels in L.A.